This piece is Japanese inspired. 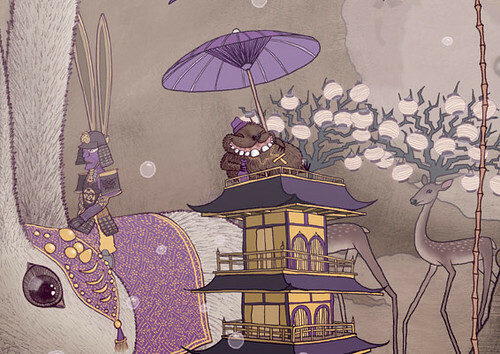 The concept makes a spin on the processions that Daimyo warlords had to make every year to the capital of Edo. I tried to make this a little more fun and less serious that the shows of power and wealth that they really were. 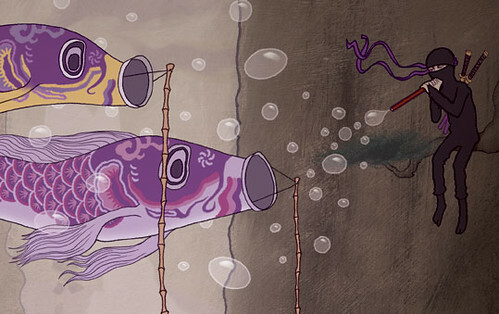 Instead of flying the Daimyo's flag they are flying Koi fish windsocks, which are used for Children's day in Japan. Instead of Ninjas blowing poison darts for assasinations they are blowing bubbles. Fun bubbles! 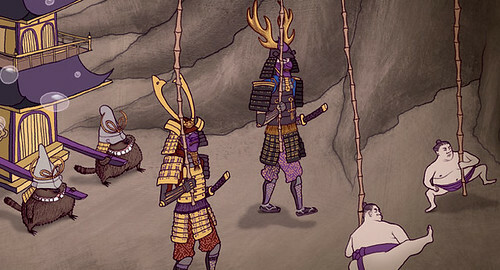 Instead of a Daimyo Warlord being carried they are carrying a Tanuki, which is a mischevious mythical Racoon-like creature. 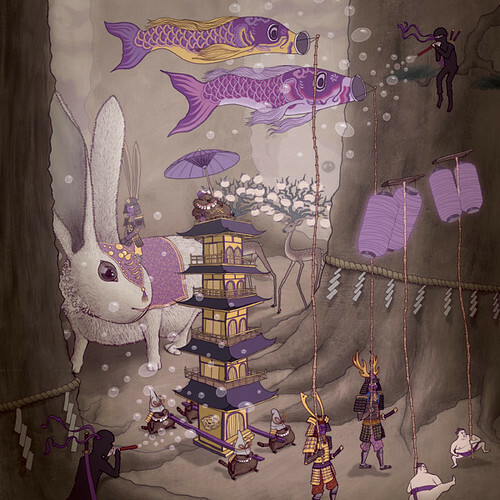 I thought it would be fun to reverse the scale of things like the mini sumo wrestlers and the giant rabbits and giant trees. samurais take super long to draw. if you tried to be true to all the detail it would take you a month to draw one. The scale of the laundry and everything in the photo is so small so I created this huge gentle giant to contrast the tiny clothes hanging out to dry. 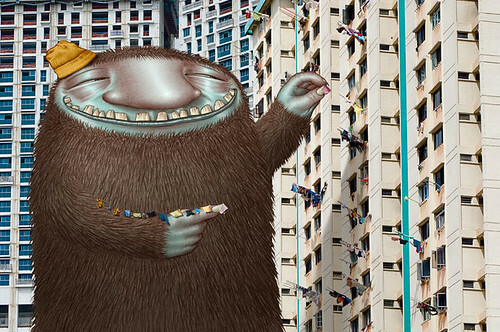 The photo is of a modern apartment complex made of concrete and steel so I tried to show something living and organic. I wanted it to look like he meant well and was helping out with the laundry, but the whole story of this beast is up the viewer. This piece is also pretty big, probably 2.5'x1.5'. I like this guy. he kind of just showed up on my napkin when i put my pen down on it when i was at dinner one night. it's awesome when things like that happen. (i mean i just drew the sketch of him without thinking, i would sheit myself if he really pulled up in a burger taxi, paid his fare in pickles, and plopped down on my napkin to havea chat with me). 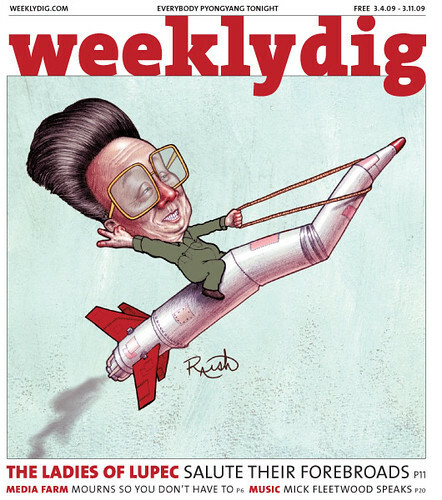 Boston's weekly Dig used my kim jong il image for their cover. This is for Employee Benefits advisor. 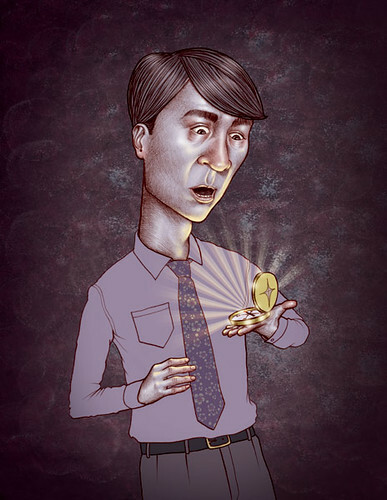 its about finding your "moral compass". i guess benefit advisors face moral delimas because they are supposed to report the health of the employees to the insurance companies or something like that and they could make more money selling high priced plans to their clients by lying about the health of the employees or something like that. it's stories like there when i'm glad the art director just gives me a brief synopsis and tells me what they want. I have been a busy beaver in the new year so here are some illustrations that i have done. a spot illustration for Motortrend. It is about Piezo crystal technology how it is being used in cars. 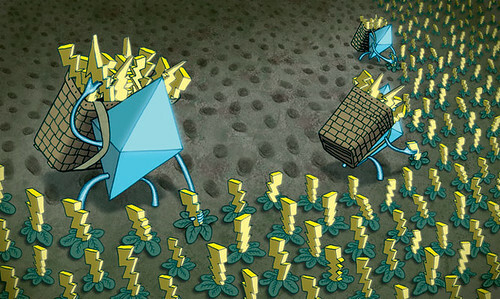 if pressure is applied to piezo crystals they generate electricity. 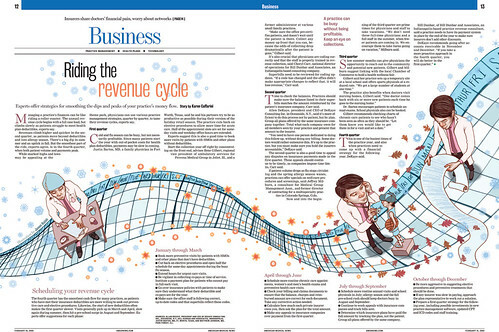 a spot in a monthly column about the rules of golf for Golf Magazine. 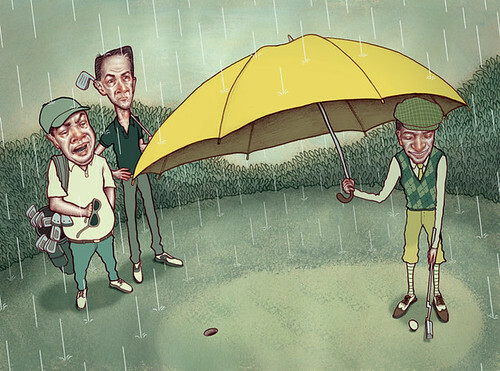 Here the reader asks if it is OK to hold an umbrella and putt with one hand, and the answer was yes. 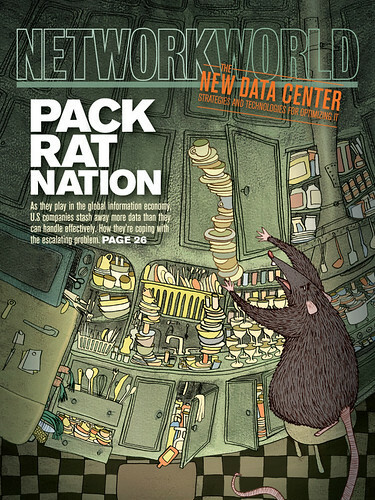 A cover I did a while ago for Network World Magazine. It's about how we Americans are pack rats and storing away so much data and how to deal with it.